This is a blog hop dedicated to giving good comment - please, when you are visiting, actually READ the post that is linked and make a thoughtful comment! This is NOT a hop for "I'm here from the hop, follow me back" comments! I choose one featured blogger from the previous week's hop - please make their blog a stop on your hopping! Please stop by and check out their blogs and leave some great comment, then link up your own SPECIFIC POST that you'd like comments on - remember - no giveaways! 2. Visit AT LEAST THREE other blogs and READ the posts and then comment thoughtfully on the post. 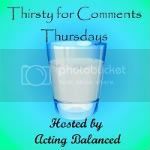 Add Thirsty for Comments to your Meme List!